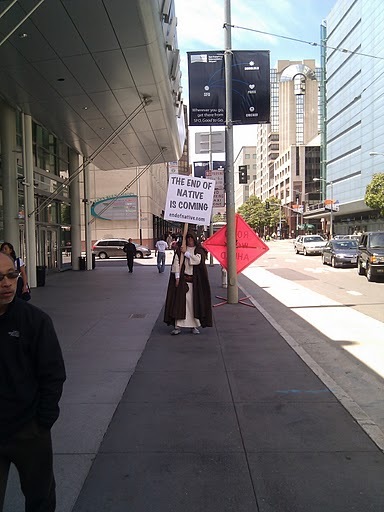 Robed "Prophets" March In Front Of Apple's WWDC Heralding "The End Of Native"
The “prophet” in question was on the wrong side of the street, but it didn’t take long to figure out that he was protesting Apple’s WWDC developer conference, which is in full swing this week. 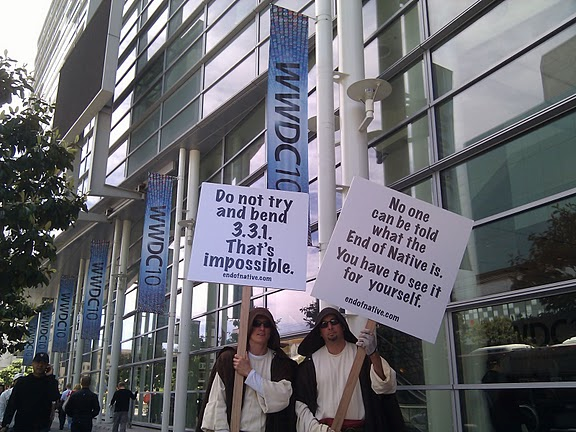 Three other men are currently marching in front of the conference center dressed in similar garb, each of them holding a sign with a different slogan — things like “Do not try and bend 3.3.1. That’s impossible” and “No one can be told what the End of Native is. 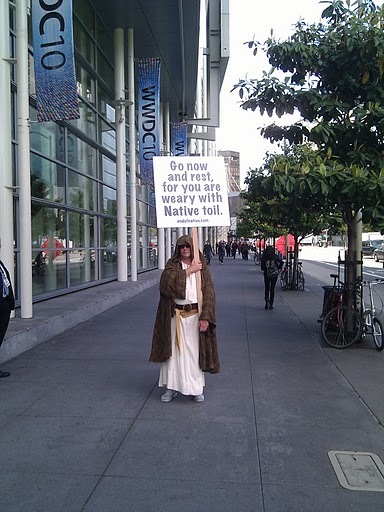 You have to see it for yourself.” Each sign instructs viewers to head to endofnative.com. Lately, some prophets of doom have been predicting the end of native applications. Well, we don’t agree. After all, can you imagine playing “Plants vs. Zombies” in a browser. At the same time, we’re sad about the state of mobile web development. Does it have to be quite so primitive? So hard to develop cross-platform? And so… well, so ugly? We think not. Next week, a new company will introduce a new generation of mobile application frameworks. It uses HTML5 to produce amazing user experiences. It’s cross platform, it’s easy to develop with, but most of all, it’s really quite beautiful. We think it will gladden your hearts and lift your souls. Obviously this is all a marketing ploy for an upcoming product, but it’s pretty funny (especially since these outfits were almost certainly repurposed Jedi costumes). I’m sure we’ll be hearing more from these guys in a week. Note that the website’s message is saying that the end of native isn’t coming, but that a new HTML5-based mobile framework is. This all of course stems from the long-standing tension between developers and the App Store’s increasingly restrictive rules (the aforementioned 3.3.1 is the rule that banned developers from using cross-compiling tools, like the one Adobe made to allow Flash apps to be used on the iPhone). When Apple CEO Steve Jobs kicked off his keynote at WWDC earlier this week, he addressed this, explaining that developers would have to follow the rules on the curated App Store but were free to do whatever they wanted in the browser. That obviously didn’t satisfy everyone.